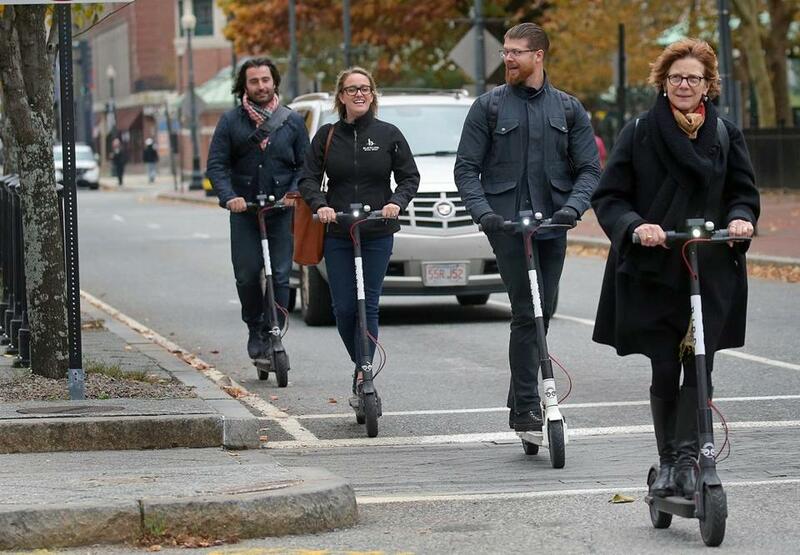 Fast, cheap, and sometimes out of control: Is Boston ready for electric scooters? Scooter riders made their way along Kennedy Plaza in downtown Providence, where a pilot scooter program is underway. Old Boston is slipping away. Dunkin’ is losing its Donuts. The Curse of the Bambino has been all but forgotten. Southie’s dive bars are turning into luxury condos. And now Boston drivers may be supplanted. If you haven’t been paying attention to the shared electric scooter craze sweeping the globe, this might be a good time to start. A fleet may be headed to the Boston area this spring as part of a pilot program, and if experience in other cities where they’ve landed is a guide, we may be in for a whole new breed of aggressive and erratic drivers. While it is true that scooter jockeys will be riding tiny vehicles that resemble a kid’s toy and go about 15 miles per hour, max, it is also true that the scooters, which are dockless and can be left anywhere, can cause an outsized amount of trouble. Think ER visits. Obnoxious scooter bros. DUI’s. Abandoned scooters blocking handicapped ramps and sidewalks. Before we look any further at what people don’t like about scooters, let’s look at what they do like, which is a lot. The scooters are an efficient way through traffic-choked cities. 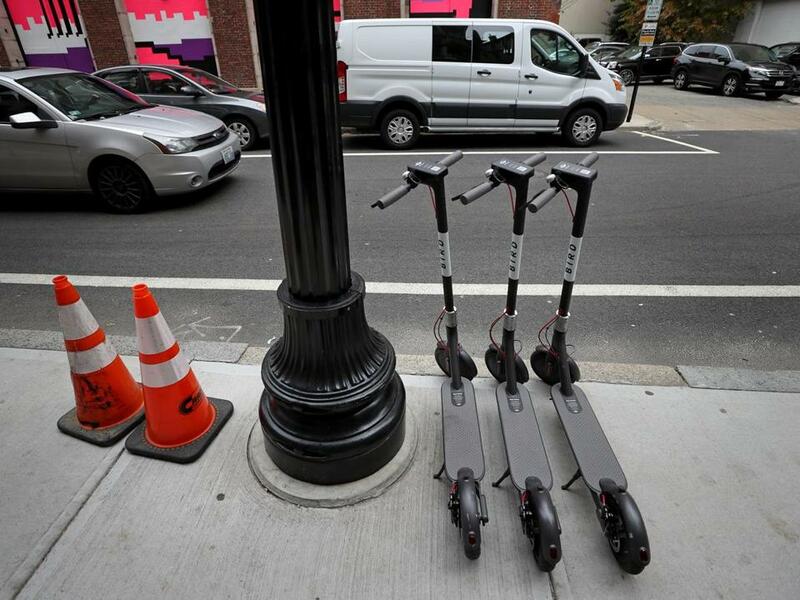 Such is their promise, that two big players in the scooter game — Bird and Lime — are each valued at more than $1 billion, according to Bloomberg Businessweek. Scooters can solve what’s known as “the last mile problem.” From home to the bus. From the T to work. From the Seaport to Government Center without the cost of an Uber or time sink of the Silver Line. You could walk, but who does that? New data from Populus, a mobility-analytics software company, suggest that dockless electric scooters may also enjoy higher adoption rates by lower-income groups and could potentially help cities make progress on equity goals. But despite the benefits, if today’s world has a divisive mode of transportation, this is it. And accidents are so frequent that personal injury law firms are now chasing scooters. Scooters don’t even need to be moving to be dangerous. A scooter blocking a curb ramp or an entryway isn’t good for anyone — not for the visually impaired, not for people who use a wheelchair or a cane, not even for A-list celebrities in perfect shape. Katy Perry was so infuriated about “[expletive] Bird scooters’’ that she chided Los Angeles Mayor Eric Garcetti during the Oct. 18 amfAR Gala Los Angeles. Scooters awaited riders on Weybosset Street in Providence. One concern is that they can an obstruction on sidewalks. The high-end David Donahue menswear catalog shows a youthful businessman in an $800 suit and $75 pocket square rocking a scooter, presumably on his way to close a megadeal or meet a babe for lunch. Foot candy has arrived. But of course nonfashionistas are interested, too. Boston, Brookline, Cambridge, and Somerville are working together to develop a multimunicipality pilot program to bring scooters to the area, according to the Boston Transportation Department. At a hearing on the scooters in October, Boston City Councilor Ed Flynn said he’s open to the scooters as “an interesting way to try to alleviate some of the congestion,” but emphasized that city rules must aim to prevent crashes and keep sidewalks clear enough for pedestrians. There were no public reports of serious accidents when Bird scooters briefly hit town last summer, but as the scooters enter ever more markets — scooter companies operate in 65 US cities, according to Vox — injuries are mounting. Two young men died in September, one riding in Washington, D.C., the other in Dallas, and emergency room doctors across the country are seeing concussions, broken noses and teeth, lacerations, and neck injuries. This summer, Megan Cunningham, 28, an account supervisor at Gear Communications in Stoneham, experienced the thrill and the heartbreak of the micromobility revolution when she vacationed with her boyfriend in Los Angeles. It was all so perfect until a scooter stopped short in front of Cunningham, a move that sent her tumbling across the sandy path, her legs scraping the ground. Cunningham has soured on scooters — “I don’t think they should come here,” she said — but in Providence, where a pilot program is underway, scooter pilot Darius Strasel, 25, was unconcerned about a little thing like mortality. He was flagged down as he scooted down busy Weybosset Street, like the vast majority of riders, un-helmeted. can be reached at beth.teitell@globe.com.